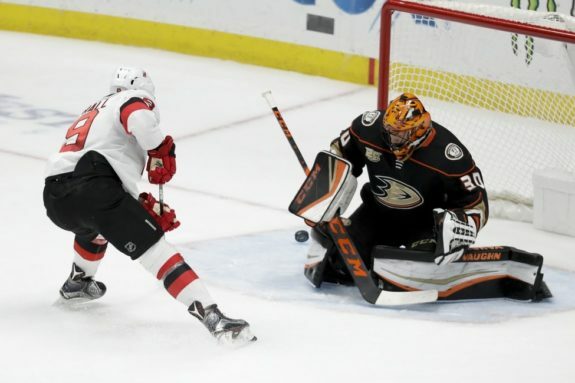 ANAHEIM, Calif. — Daniel Sprong and Ryan Getzlaf scored in the shootout to lead the Anaheim Ducks to a 6-5 victory over the New Jersey Devils on Sunday. Anaheim goalie John Gibson blocked one New Jersey shot in the shootout and Taylor Hall’s attempt bounced off the crossbar. Jakob Silfverberg, Kiefer Sherwood, Brandon Montour, Pontus Aberg, Ondrej Kase scored in regulation for the Ducks, with three of the goals deflected off New Jersey players. Anaheim’s Ryan Miller, looking to become the all-time leader in U.S.-born goaltender wins, left the game with 12:47 left in the third period after a pair of players crashed into him at the net. He appeared to have injured his left leg. Miller stopped 23 of the 27 shots he faced. Gibson had seven saves through overtime. Kyle Palmieri had two goals for the Devils, and Damon Severson, Brent Seney and Marcus Johansson also scored. Cory Schneider stopped 33 shots. The Ducks picked up two aided goals in the third period. Aberg’s long, blind backhand when off the hand of New Jersey’s Ben Lovejoy to tie it at 4-4 and Anaheim took the lead when Kase’s goal was knocked in by Andy Greene, attempting to bat it away from the net. New Jersey pulled Schneider for an extra skater with 57.8 seconds left in regulation and Johansson scored after a scramble in front of the net. Only one goal was scored in the second period, New Jersey converting a turnover by Anaheim into Seney scoring on a rebound and a 4-3 lead. Palmieri opened the scoring, snapping in a rebound past Miller just 1:38 into the game. The Ducks answered quickly, a screened Silfverberg firing from long distance to tie it. Sherwood gave Anaheim a brief lead when he completed a breakaway, his shot deflecting off the leg of Stefan Noesen in front of the crease and into the net. The three goals were scored in a 59-second span. New Jersey tied it at 2-2 on Palmieri’s second goal of the period, wristing in a quick shot on a feed from Taylor Hall behind the net. The Devils went back up on Severson’s power-play goal, but the Ducks tied it again on Montour’s goal to end the high-scoring period. Devils: At San Jose on Monday night to complete a three-game road trip. Ducks: Host Dallas on Wednesday night to cap a four-game homestand.